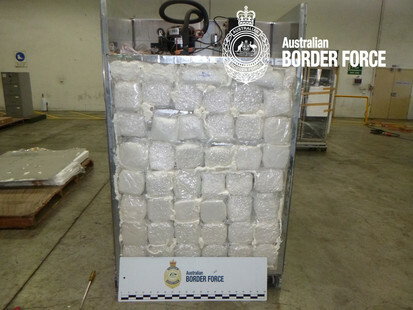 A joint investigation has commenced after more than $400 million worth of methylamphetamine was seized by law enforcement at the Australian border. According to a press release by Australian Border Force (ABF), on 30 March 2019 ABF officers at Sydney Container Examination Facility examined a container. They found 11 commercial refrigerators instead of declared electronic ovens. After inconsistencies were revealed by X-rays, the refrigerators were unpacked. Seven refrigerators were found to contain a total of 561 packages of white crystalline substance, with presumptive testing returning a positive indicator for methylamphetamine, otherwise known as ‘ice’. The found drugs have been seized and a joint agency investigation has been established consisting the Australian Federal Police, NSW Police Force’s Organised Crime Squad, and the Australian Border Force. Two search warrants were executed at a commercial premise at Wetherill Park and a home at Edensor Park on 5 April 2019. Officers seized documents and electronic storage devices relevant to the investigation. Anyone with information in relation to organised criminal activity is urged to contact Crime Stoppers: 1800 333 000 or https://nsw.crimestoppers.com.au. Information is treated in strict confidence.